My dress is, I believe, quite historically accurate. I have taken a good amount of time and patience to get this project right, done plenty of historical and fashion research, and my public approval has come unwarranted in the form of comments from strangers. The best part about my hankie-hem dress is the way it fits, how it feels so fun, and is very comfortable to wear! 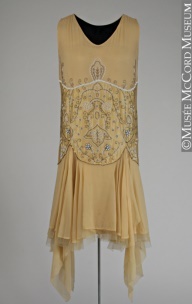 My dress is meant to channel the ‘turn of the decade’ 1929 look, as evidenced by my early 30’s features: Cuban heeled shoes, my Deco style Y-shaped drop pearls, and the small barely- flutter sleeves. Here I’m posing with a 1929 Ford. Now, for a brief history overview. The year 1929 was quite a tumultuous year. The world at that time, I mean the people and the events they caused, shows just how determined were the attempts to find out the right places for everything on the brink of a new decade. However, it’s a matter of fact that what goes so far ‘south’ (Admiral Byrd was the 1st to fly over the South Pole in ’29), must boomerang back, as is especially the case in regards to “Black Thursday”, the Stock market crash of October 24, 1929. Even fashion was no exception to the rule…after hemlines were at their shortest lengths above the knee from 1926 to 1928. There was no doubt somewhat of a general outcry, and by 1929 uneven hems and asymmetric skirt hemlines helped the transition to new longer, more subdued hemline lengths. Longer sheer over skirts and semi-sheer top skirts were worn over opaque linings as another way to gently ease away from the flapper enthusiasm while still attaining a new 30’s ideal of decency. FABRIC: 1 1/8 yd. 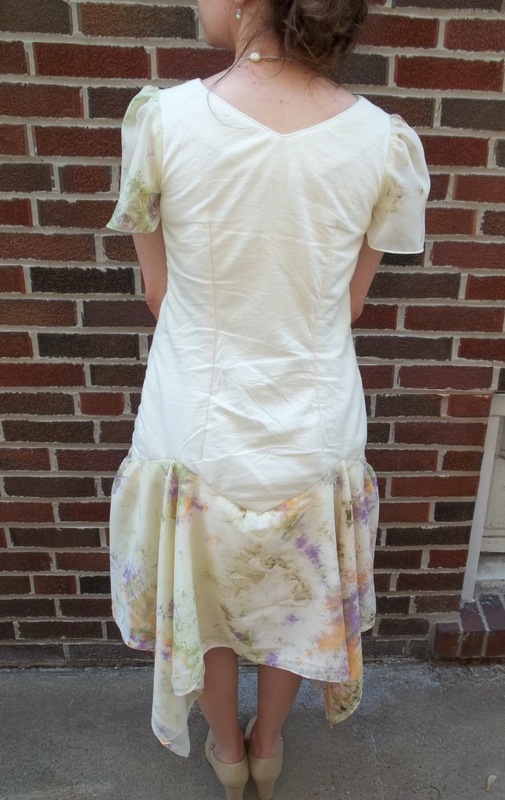 of deep cream brushed flannel; ivory lace from stash; remnants of poly cling-free ivory lining for behind the flannel; 1 1/2 yard of pale yellow floral chiffon (poly blend) for the skirt and sleeves; 1 1/4 yd. of lingerie polyester to line the chiffon. My poly fabrics are the only non-historical part. NOTIONS: I already had all the thread and interfacing that was needed. I only bought a zipper. 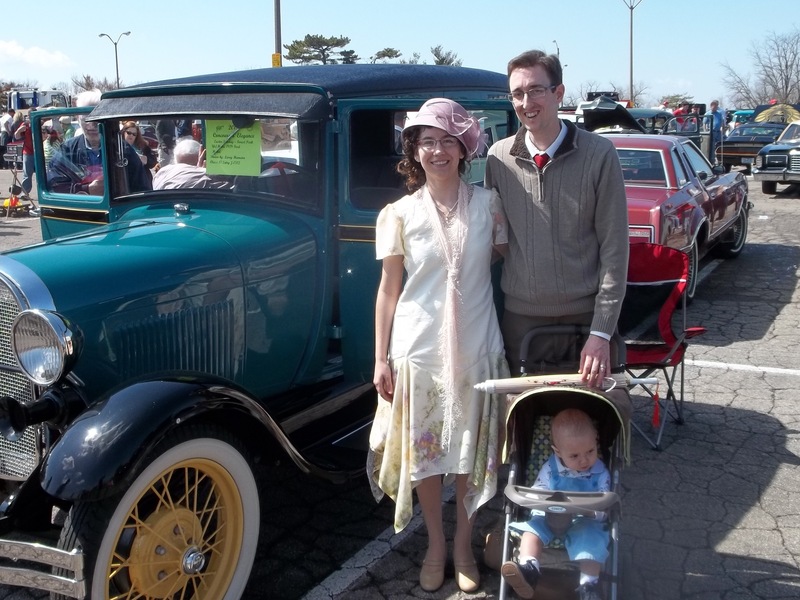 FIRST WORN: to an Easter Sunday antique car show. The top tunic of my ’29 dress was sort of a whim, a “throw it together because I’ve been wanting to make this pattern” sort of thing. (I’m sure most of you have done this too!) It went together quickly, easily, and turned out nicely while still fitting quite well. I added the lace at the shoulder section to highlight the design and add a touch of femininity. The funny thing is how sewing one project evolved into the finished dress. Flannel is actually quite accurate for my dress and had been used for clothing -both men’s and women’s- more frequently in the past. Traditional/historical flannel, which has been around since the early 16th century, would be wool or a silk blend and cotton flannel is a rather modern invention. The lighter colors of flannel, like my dress’ pale hue, became popular in the early 1900’s with use of bleaching (instead of dying), achieving the cool summer looks such as “Cricket white”. 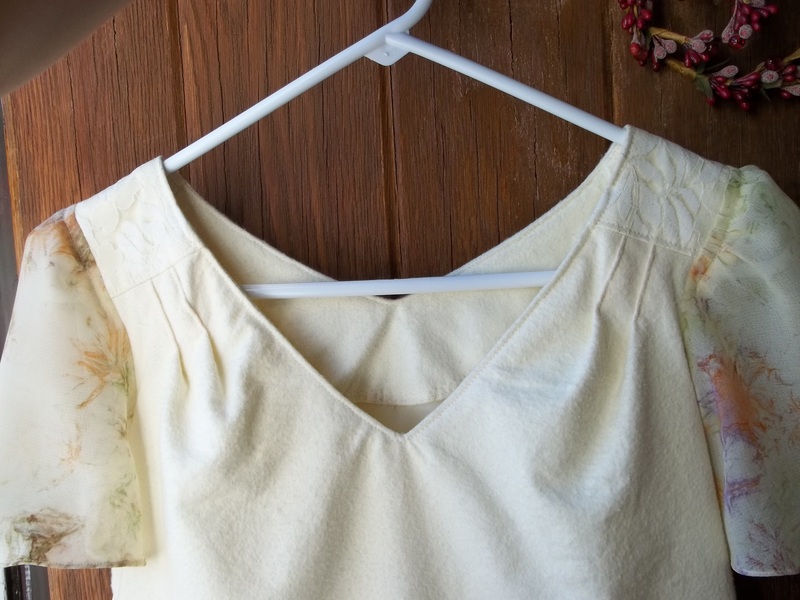 My flannel tunic is lightweight and the facing makes for a super soft feel around the neckline. I had it floating in my stash, leftover from the backing of a blanket I made for my mom. I went through several differing preliminary drawings to figure out how best add the chiffon. My drawing at left is the closest to my finished look. 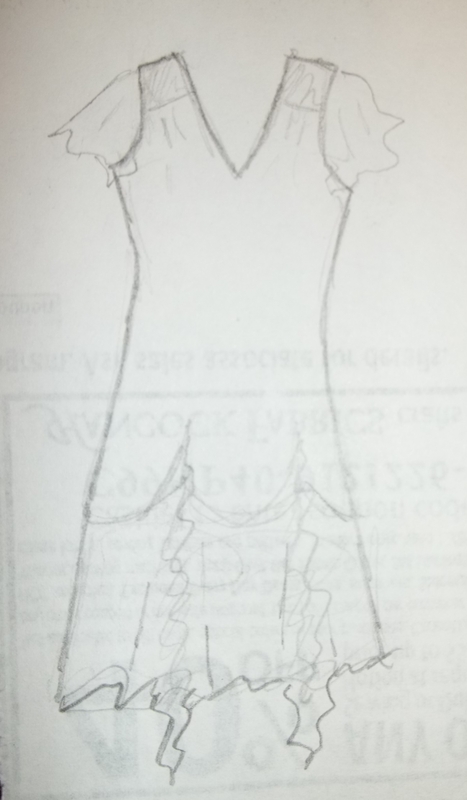 Early on, I envisioned the chiffon as 1) draped across the front and back, 2) gathered up in layers, 3) heavy beading or sequins, and even 4) vertical bias ruffles, which I almost used. I kept simplifying my ideas and staying away from the 30’s. Early in February I even found a fancy bed skirt that seemed like it might have looked good at the bottom of my tunic, but it will be better as an individual skirt. 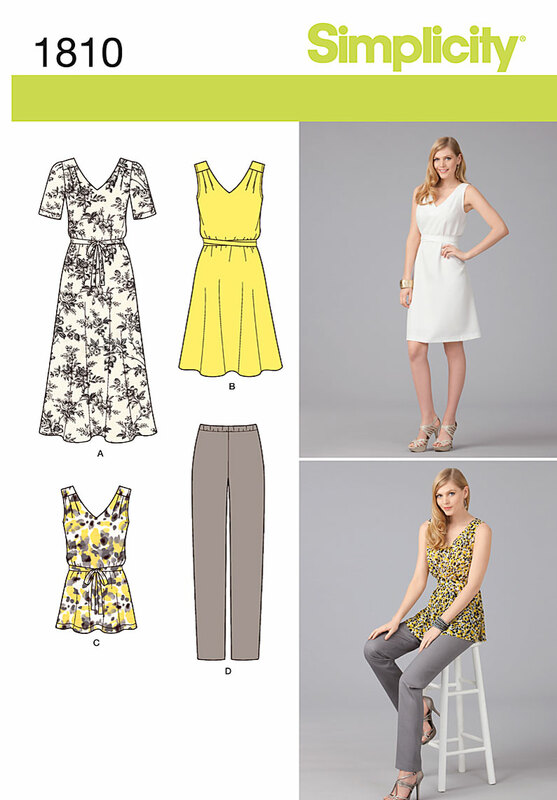 My husband was the one who picked the Simplicity 7227 I used for the dress’ bottom half, while I designed the zig-zag “hem” where the tunic bottom and skirt meet. Those two features of our joint design gently incorporate the bottom skirt into the rest of the dress, and are very similar to vintage originals, like this Vionnet made dress at left. Completing my hankie hem dress was more time consuming than I had foreseen. First of all, finding the right lining was a challenge. It was hard to find something that had a drape complimentary to the chiffon, as well as being opaque, and creating the right tint to match the flannel tunic. I would have preferred to use a soft, lightweight cotton lawn, but I settled on a semi- shiny lingerie polyester. Then, both the lining and the chiffon had to be cut, and the pattern piece for the skirt bottom was so unexpected…a large rectangle with a hole in the middle on the fold. The hems of both lining and chiffon received my 1/8 inch tiny hem treatment, which makes for some time-consuming, thread-eating, beautifully invisible seams. Since the top “hole” of the skirt was mostly on the bias, the fabric at that cut was stretched out as I sewed. Next, I went to work measuring and centering the flannel tunic bottom so I could start adding the skirt bottom. The lining and chiffon had been sewn together at the “hole”, and I can’t begin to express how frustrating it was to add the horizontal zig-zag seam. Stretch, shape, pin, measure again, maybe unpin, and shape anew over and over was the regimen. No matter where or how I would work, it was hard on the hands, back, and eyes. 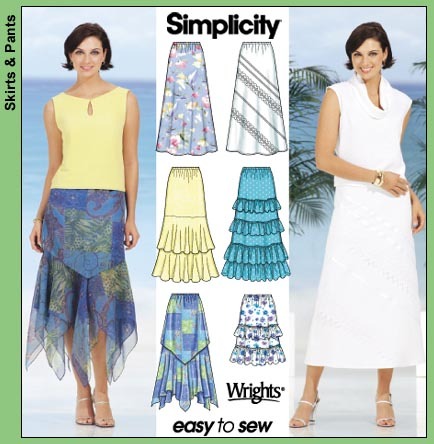 As it ended up, the sides of the chiffon have small gathers to aid in the side shaping and gathering. I think my determination to see it done got me through. My last minute touches were to add a side zip (so as to get a better fit without it being tricky to get into) and small hand tacks to keep the points of the lining and chiffon hanging evenly with each other. 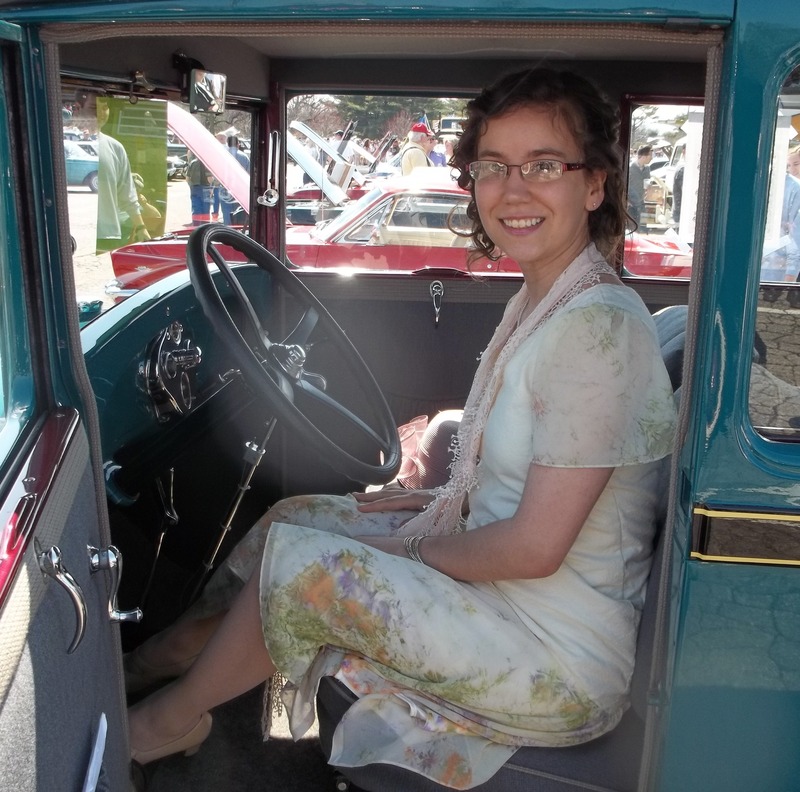 All the time spent towards making my hankie hem dress made me a very lucky girl when I wore it to the Easter car show. 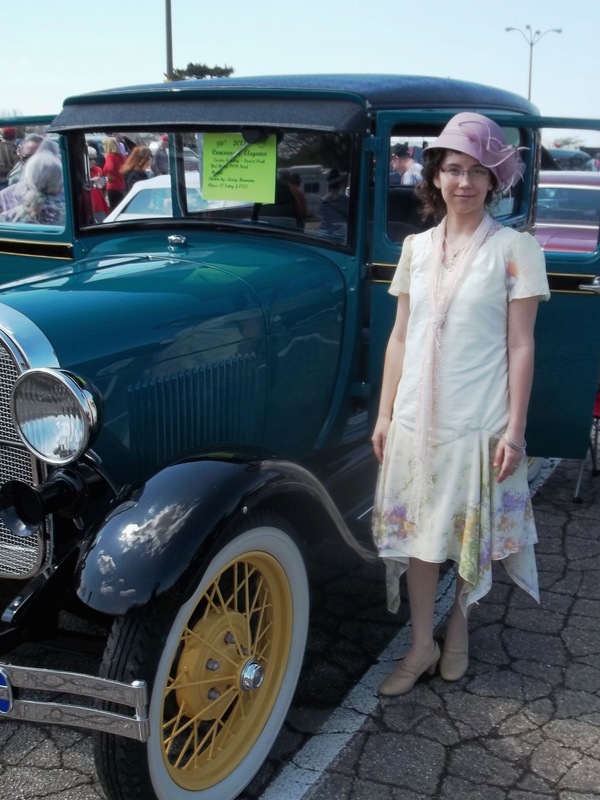 Many of the owners of 20′ and 30’s era car recognized the time period of my dress, pointed me out, called me over, and invited me to take a seat in their vintage cars. The car owners said very few people actually get to sit in their cars and check them out, so that day I felt special to have such unique opportunities. We have some wonderful pictures of hubby and me in a 1925 Model T Touring (not in my post), and – my favorite – a great family photo (below) of our Easter. Go, sit back, and look up some of the facts and historical landmarks of 1929. I think you might be amazed, as I was, to find how advanced the world was in that year, as well as all the achievements that were made as well. For example, did you know that in 1929 color TV was first patented and demonstrated publicly? I know this has nothing to do with sewing except for helping a realization that back then compared to now are really not that foreign, but have a lot in common.